I have been doing some updates to my blogs and trying to get them 'linked' together. I think I have finally achieved success. You can now visit my clip art blog Oodles of Doodles by clicking on the 'clip art' tab above. 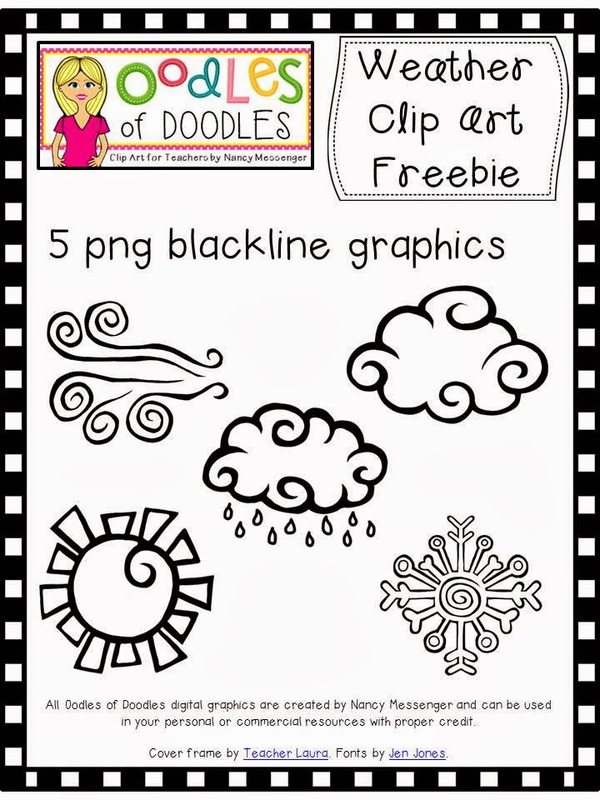 Today I am giving away some simple blackline weather clip art. Try using the link above to grab a copy. I have a new Kindergarten Math Journal for February. It is free right now on TPT so grab a copy quick. There is a color and b/w version of every page. I made this last year but it really is timeless. I'm posting it again in case you never got it. Just found you and love your stuff...that weather journal is so cute and the calendar numbers, ADORABLE! Have you thought about leprechauns...boys and girls? I'm always looking for leprechauns looking a little "tricky" and also looking happy. Your artwork is so cute! Would love to see what you would come up with in the leprechaun department! All I know is I am a FAN! Thank you! Thanks for the weather doodles. They are darling!